A new way to rent the yacht of your dreams. Whether it be for a special occasion or just because you want to enjoy the day out, we are here for you. Our fleet of vessels includes a variety that will suit your taste and your pocket. Unlike most companies, we rent luxury yachts with a more flexible time frame, and can rent our vessels for as little as 2 hours. So sit down and relax, we have everything covered for you. All you need to worry about is enjoying the beautiful sights of Miami and South Beach while drinking a cocktail on a luxury yacht. What makes us different: We rent our own vessels and offer a wide range of trained professionals to charter our boats. All our captains are U.S. Coast Guard certified and all our vessels comply with U.S. regulations for chartering them to our customers. Don’t see what you’re looking for? Contact us! We are always happy to help and to show you a good time in Miami. 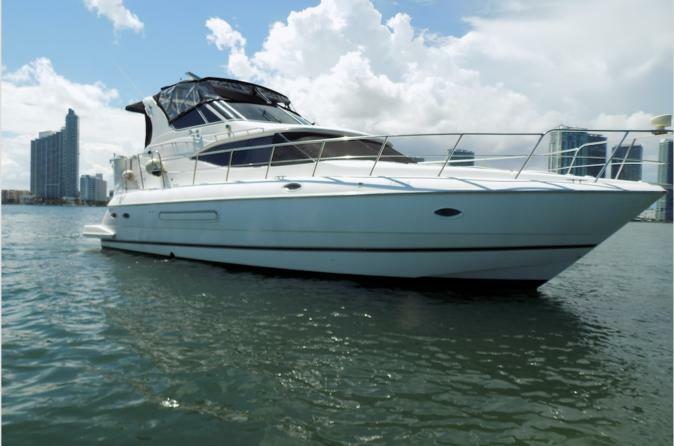 This beautiful 48' Cruisers yacht is the perfect yacht to spend the day out in the Bay. Nkulu has 3 bedrooms and 2 full bathrooms. With 2 diesel 3126 CAT motors, it guarantees a smooth ride around Miami. Perfect for any outing as short as 2 hours and up to 8 hours. Includes gas, crew, ice, water, and a complimentary bottle of champagne per 6 passengers. Customer can bring food and drinks as well as decorations if it's a special occasion! Fully insured and legal operation under all U.S laws. - Pets allowed only outside - Deposit of $500 needed. Fully refundable as long as no damage is done to the vessel. - No illegal substances allowed on board.